Reception & Gallery Talk | Master Metalsmith: Lisa Gralnick - Number: Inc. The Metal Museum is pleased to announce Lisa Gralnick as the 2018 Master Metalsmith. Gralnick is an artist esteemed for her impact on the metals field, particularly in jewelry and sculpture. Join us on September 30th from 4PM – 6PM for an opening reception and gallery talk with the artist. The gallery talk will begin at 5PM and light refreshments are provided. This retrospective exhibition will showcase work from throughout Gralnick’s career including jewelry from her Black Acrylic, Mechanical, and Reliquaries series as well as The Gold Standard series of sculptures and jewelry. Gralnick’s latest body of work, Scene of the Crime, will be shown in its entirety for the first time and features extremely oversized jewelry as sculptural installations. Master Metalsmith: Lisa Gralnick will be on display at the Metal Museum from September 30, 2018 – January 13, 2019. *This is an all-ages free event. *Free street parking is available along Metal Museum Drive. 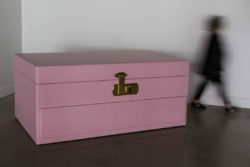 image: Lisa Gralnick, Jewelry Box. Photo courtesy of Jim Escalante.